Description This chapter provides an overview of the Chaos and CluesThis glossary term has not yet been described. decision algorithmIn mathematics and computer science, an algorithm (Listeni/ˈælɡərɪðəm/ AL-gə-ri-dhəm) is a self-contained sequence of actions to be performed. Algorithms can perform calculation, data processing and automated reasoning tasks. for the assessment of pigmented skin lesions, both melanocyticThis glossary term has not yet been described. and non-melanocytic. 2.2.2.1 Grey or blue structures (including grey or blue structureless). 2.2.3.4 Any lesion on acral skin with a parallel ridge pattern. Chaos and Clues, Melanoma, Algorithm Chaos and Clues – cite! Chaos and Clues (message) Chaos and Clues – participate! Chaos and Clues: a decision algorithm for pigmented lesions based on revised pattern analysisThis glossary term has not yet been described. Revised pattern analysis is designed to lead to a provisional diagnosisis the identification of the nature and cause of a certain phenomenon. Diagnosis is used in many different disciplines with variations in the use of logic, analytics, and experience to determine "cause and effect". In systems engineering and computer science, it is typically used to determine the causes of symptoms, mitigations, and solutions in a logical stepwise process. Chaos and Clues on the other hand is an algorithmic method which uses pattern analysis to guide the clinician in a stepwise process to the decision about whether (excision) biopsy is indicated. Before considering the dermatoscopic decision algorithm Chaos and Clues, it is relevant to also consider what is actually done in the daily routine of clinical practice. 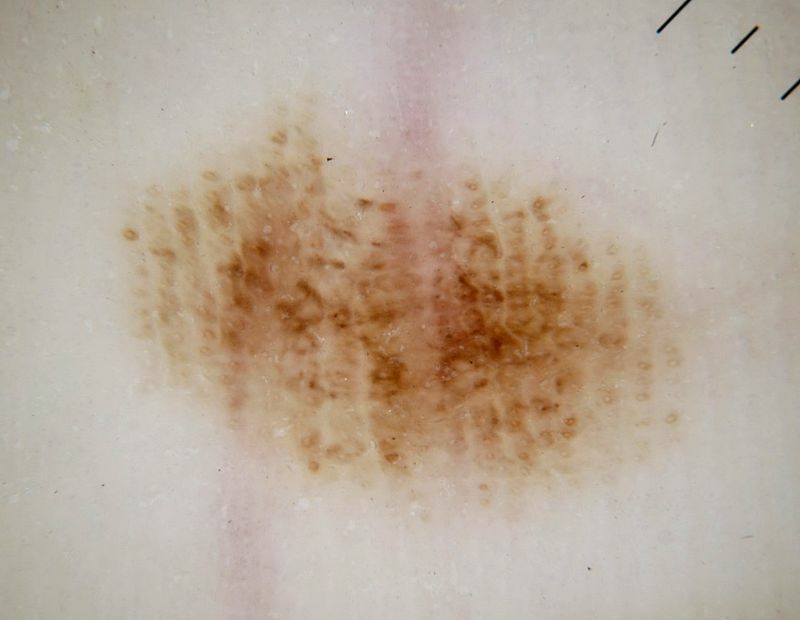 Although the clinician is ideally encouraged to apply the dermatoscopeThis traditionally consists of a magnifier (typically x10), a non-polarised light source, a transparent plate and a liquid medium between the instrument and the skin, and allows inspection of skin lesions unobstructed by skin surface reflections. Modern dermatoscopes dispense with the use of liquid medium and instead use polarised light to cancel out skin surface reflections. to all lesions on a patient, a detailed algorithmic analysis of every lesion is neither realistic nor necessary. The vast majority of skin lesions are benignis any condition that is harmless in the long run and can be diagnosed dermatoscopically by pattern recognition . The main benign lesions, pigmented and non-pigmentedThis glossary term has not yet been described., which can be encountered every working day can be divided into 5 groups: nevusThis glossary term has not yet been described. ; benign keratinocytic; hemangiomaThis glossary term has not yet been described.This glossary term has not yet been described. ; dermatofibromaDermatofibromas are hard solitary slow-growing papules (rounded bumps) that may appear in a variety of colours, usually brownish to tan; they are often elevated or pedunculated. A dermatofibroma is associated with the dimple sign; by applying lateral pressure, there is a central depression of the dermatofibroma. and sebaceous gland hyperplasia. Because these lesions are ubiquitous the clinician can very rapidly become an expert at recognising them by deliberately looking at thousands of them to understand their characteristic protean variations . . There are two steps used to triage skin lesions in the decision making process. The first step is to decide if a lesion is suspicious and the second is to decide whether it is likely to be malignantThis glossary term has not yet been described.. Dermatoscopic chaos is the most compelling factor in deciding whether a pigmented lesion is suspicious, and this along with some other “red flags” should determine the first part of the triage process. Benignis any condition that is harmless in the long run lesions tend to have biological symmetry and this symmetry occurs in the form of recognisable patternsThis glossary term has not yet been described., just as faces of different species of animals have recognisable patterns. We will recognise any dog’s faceis a central body region of sense and is also very central in the expression of emotion among humans and among numerous other species. by pattern-recognition even though there are many different morphological varieties of dog faces. In figure 1 there are six different imagesA representation of a person, animal or thing, photographed, painted or otherwise made visible. 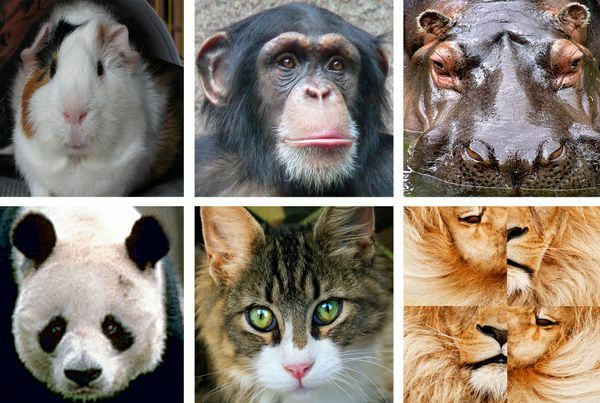 of animal faces. The first five are recognisable as “normal” faces because even though they are not necessarily perfectly symmetrical they are biologically symmetrical and therefore recognisable. They do not exhibit chaos. The sixth image on the other hand is not biologically symmetrical. It is chaotic and therefore unrecognisable which means that pattern analysis must be used to weigh cluesEvidence, in an investigation to identify what it represents. Figure 1: In this collage of faces the first five are recognisable by pattern recognition because they are biologically symmetrical. The sixth exhibits biological asymmetry (chaos) and therefore may require analysis of the patterns present to achieve recognition. The common benign skin lesions we may see every day are also recognisable because of biologically symmetrical characteristic patterns (figure 2). Just as there are many different morphological varieties of dogs and fish there are many different morphological types of nevus and of seborrheic keratosisThis glossary term has not yet been described. but the experienced clinician will recognise them instantly through the dermatoscope as naevi or seborrheic keratosesThis glossary term has not yet been described. and move to the next lesion. Becoming an expert at pattern recognition of common benign lesions just requires one thing – the deliberate examination of thousands of them with a dermatoscope. 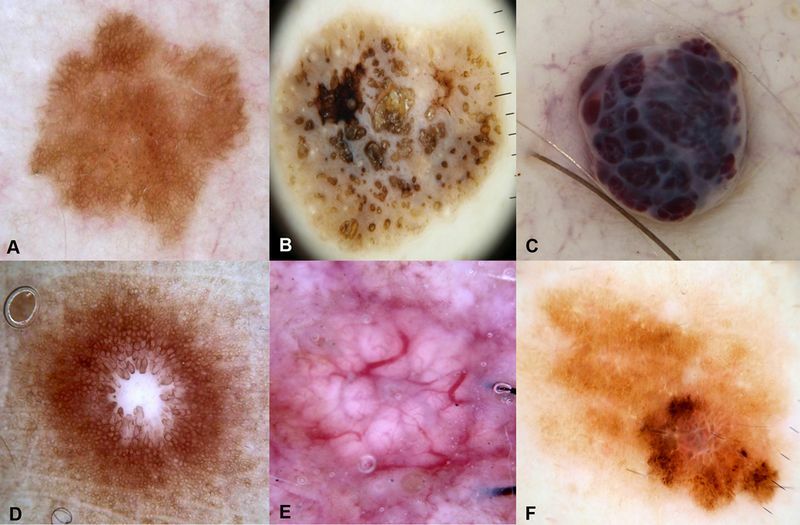 Figure 2: To an experienced dermatoscopist the first five lesions in this collage are biologically symmetrical (no chaos) and will be diagnosed by pattern recognition as (A) nevus, (B) seborrheic keratosis, (C) hemangioma, (D) dermatofibroma and (E) sebaceous gland hyperplasia. The last lesion (F) is asymmetrical and cannot be recognised as any of the common benign lesions so pattern analysis is applied. It is disorganised (chaotic) with clues to malignancy; melanomaThis glossary term has not yet been described. invasive. Red Flags represent the features that flag a lesion as suspicious and therefore warranting formal algorithmic assessment. These features are such that they will either be known (patient concern), be obvious (clinical pattern-breaker) or be recognisable during scanning dermatoscopic evaluation (chaos of pattern, colour or border abruptness, dermatoscopic clues to change and dermatoscopic uniqueness). 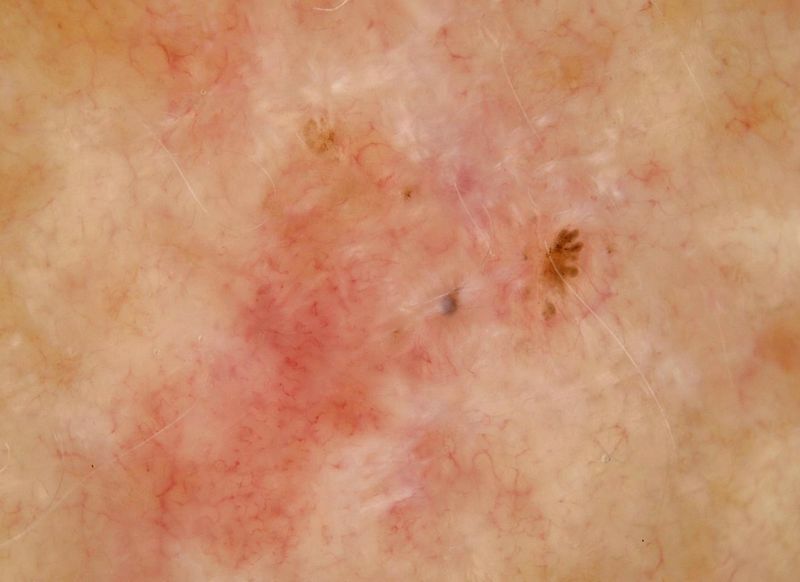 No lesion of patient concern should ever be dismissed without targeted examination including dermatoscopyThe examination of [skin lesions] with a 'dermatoscope'. This traditionally consists of a magnifier (typically x10), a non-polarised light source, a transparent plate and a liquid medium between the instrument and the skin, and allows inspection of skin lesions unobstructed by skin surface reflections. Modern dermatoscopes dispense with the use of liquid medium and instead use polarised light to cancel out skin surface reflections. . 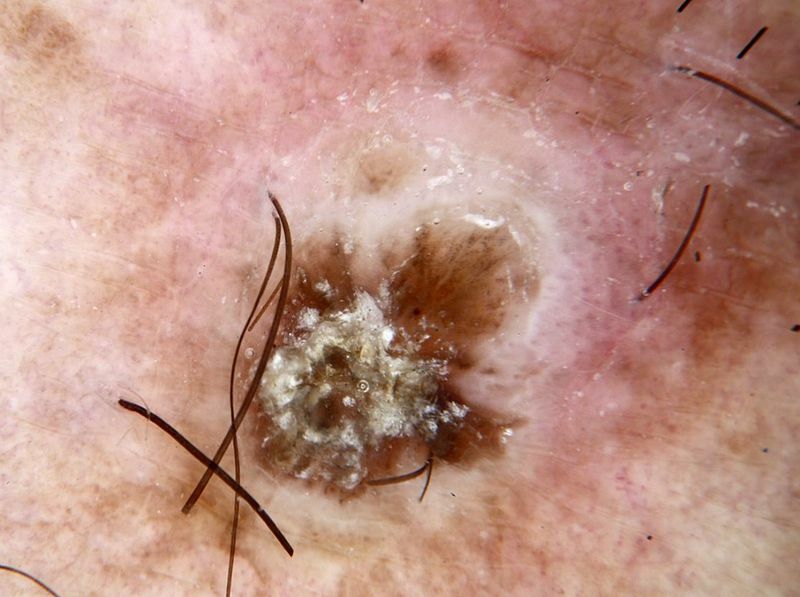 Patients may be concerned because a seborrhoeic keratosis is large and black, because a haemangioma has apparently suddenly appeared or because a mole is perceived to have changed. Patient concern should automatically flag a lesion as suspicious and lead to an analytical assessment. Similarly documented evidence of change at mature ageprocess of becoming older, including deliberately monitored change, flags a lesion as suspicious therefore requiring focussed dermatoscopic assessment. The same disorganised and uncontrolled behaviour of malignant tissue that causes dermatoscopic chaos often causes malignant lesions to break the pattern of the surrounding skin clinically. Malignant lesions may arise randomly, have an irregular unexpected shape or colour and eventually their unrestrained growth may make them larger than surrounding benign lesions. A lesion which breaks the pattern clinically should be flagged as suspicious and dermatoscopically analysed. Peripheral clodsThis glossary term has not yet been described., radial lines and pseudopods are all dermatoscopic clues to change. Peripheral clods may not cause concern in adolescence but any clues to change should flag a lesion as suspicious at mature age (see figure 3). At intermediate age this feature should be assessed in the contextThis glossary term has not yet been described. of other lesions on the patient. Segmental radial lines or pseudopods should be recognised as a Red Flag at any age. Figure 3: Two lesions both with the dermatoscopic clue to change of peripheral clods. The lesion on the left was a growing nevus on the back of an adolescent (not excised). 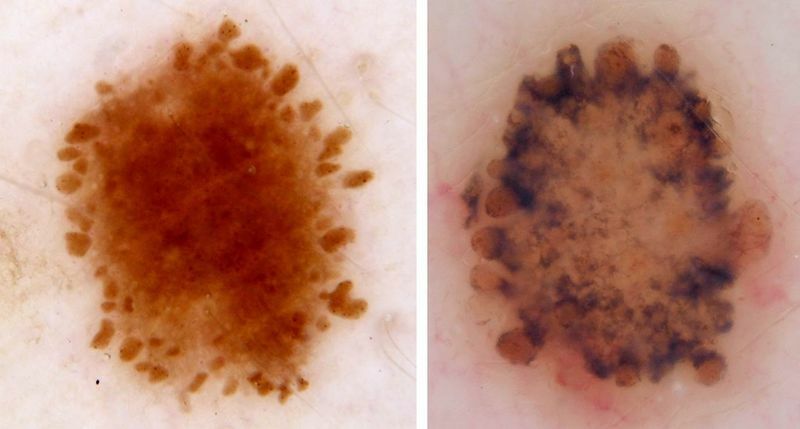 The lesion on the right was on the back of a 60 year-old woman and it was excised; nodular melanomaThis glossary term has not yet been described. 3mm in diameter with a Breslow thickness of 0.9mm. Note that the melanoma, although arguably symmetrical, has a disorganised structure compared to the naevus, consistent with the chaotic behaviour of malignant tissue. When clinical and dermatoscopic examination identifies a Red Flag as defined above, the lesion is flagged as suspicious and is subjected to careful, methodical examination by the method of choice. While we prefer to use Chaos and Clues, we do not believe that the performance of an expert using an alternative method will be in any way inferior. We prefer Chaos and Clues because we have found that it is easy to teach and relatively easy to employ in busy routine practice. It also uses clearly defined geometric terminology facilitating unambiguous communication between professionals, this being particularly relevant with teledermatoscopy. Expert diagnosis has more to do with experience and expertise than choice of method. However a method that cannot be taught is barely a method at all. The flowchart for the Chaos and Clues algorithm is shown in figure 5. Figure 5: Flowchart for the Chaos and Clues algorithm. Pigmented lesions are first assessed for the presence of chaos (chaos is defined as the presence of dermatoscopic asymmetry of any or all of, pattern, colour and border abruptness) and if chaos is present they are examined for any one or more of nine clues to malignancy. If a clue is present an excision biopsy is considered unless an unequivocal diagnosis of seborrhoeic keratosis can be made by pattern analysis. There are four exceptionsThis glossary term has not yet been described. in which excision biopsy is considered even for non-chaotic lesions: any changing lesion on an adult, a nodular or small (<6mm) lesion (lacking the morphologyThis glossary term has not yet been described. of a known benign lesion) which has any clue to malignancy, any lesion on the head or neck (lacking the morphology of a known benign lesion). with either pigmented circles or dermatoscopic grey colour and any acralPertaining to peripheral body parts, especially hands, feet, fingers, and toes. lesion, with a parallel ridge patternVolar pigmentation forming lines, parallel, diffuse and irregular, along the ridges or cristae superficiales (raised portion of the dermatoglyphics) pigmented by melanin. While natural laws (gravity, electrical and magnetic fields, surface tension and feedback mechanisms) favour symmetry, malignant tissue defies natural laws and this is the basis for both dermatopathological and dermatoscopic chaos in malignant tissue (see figure 6). This chaotic behaviour of malignant tissue also produces all of the other red-flag characteristics described earlier as well as the clues to malignancy described hereunder. If a dermatoscopist is equivocating about the presence of chaos the situation is usually resolved by considering whether the dermatoscopic pattern is consistent with the chaotic behaviour of malignant tissue. Chaos is defined as the presence of dermatoscopic asymmetry of any or all of, pattern, colour and border abruptness. This differs from asymmetry as assessed by the method described for revised pattern analysis in that chaos of border abruptness is not included in that method (see figuresThis glossary term has not yet been described. 7, 8 and 9). Any irregularity of the shape of a lesion is not relevant. Chaos of pattern requires that there be more than one pattern (a pattern covering a significant area of the lesion, arbitrarily defined as at least 20%) with the patterns being combined asymmetrically. If either of the highly specific defined clues: peripheral black clods/dotsDots are small, round structures of less than 0.1 mm in diameter that have a red color when corresponding to blood vessels; however, when due to melanin, their color ranges from black, brown, to blue-gray depending on the depth and concentration of the melanin in the skin (Tyndall effect)., lines radial segmental/pseudopodsBulbous and often kinked projections seen at the lesion edge, either directly associated with a network or solid tumor border., is present asymmetrically in a lesion, that suffices to produce chaos even if the structure does not cover sufficient area to produce a pattern. Chaos of colour requires that there be more than one colour (light and dark brown being regarded as different colours if the transition between them is abrupt), with those colours being combined asymmetrically. There is no lower limit on the area required to be covered by a colour to create asymmetry if that variation is obvious and abruptly demarcated. Chaos of border abruptness is defined as definite and asymmetric variability in the abruptness of demarcation of the border of a lesion*. While border abruptness is also assessed in the ABCDThis glossary term has not yet been described. method of dermatoscopy, this is given most significance in that method when the total border is abrupt. The ABCD method would therefore allocate the highest score for border abruptness to an ink-spot lentigo (figure 8) or solar lentigoThis glossary term has not yet been described. and a lower score for a lesion which has abruptness of only a portion of the border (figure 9). In fact abruptness of the total border is a feature of benignancy while chaos of border abruptness is more likely in a malignant lesion. 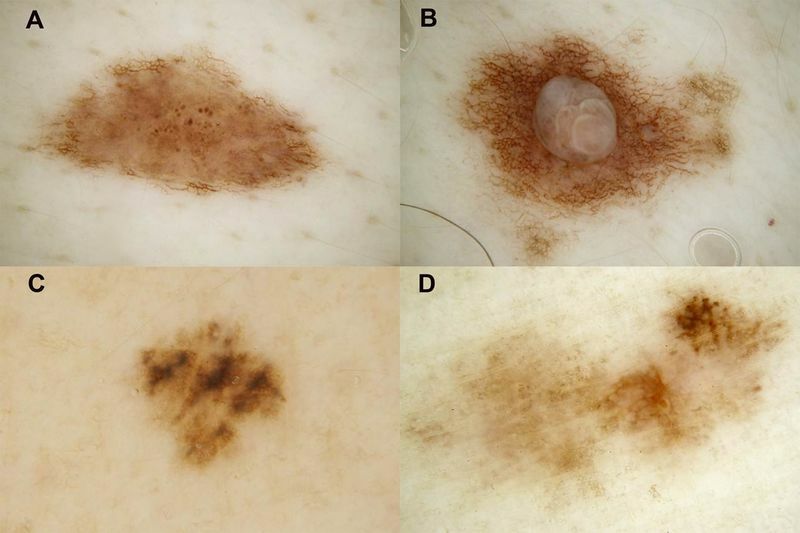 Figure 6: Dermatoscopic chaos can be seen to increase along with histological disorganisation moving from peri-lesional skin (a) to melanoma in situ (b) to invasive melanoma (c), all being encountered on the same patient on the same day. Figure 7: This composite of four lesions from the same patient shows only one (lower right) with dermatoscopic chaos. It was excised and confirmed as a melanoma in situ. The other three lesions have been confirmed as benign by stability over time. Their morphology is consistent with the diagnosis of compound congenital-type nevus. A: Central clod pattern surrounded by a structureless pattern with a pattern of lines at the periphery – concentric symmetry; B: Central skinThis glossary term has not yet been described.-coloured clods and peripheral pattern of lines – concentric symmetry; C: Structureless pattern with central grey and brown above and below – symmetry. Shape is irrelevant and none of the lesions A-C has a pattern consistent with the chaotic behaviour of malignant tissue; D: unequivocal asymmetry of both pattern and colour consistent with the chaotic behaviour of malignant tissue. It is also the only one with chaos of border abruptness. Figure 8:An ink-spot lentigo has an abrupt border over the total periphery which would give it a high score in the ABCD method of dermatoscopy. However the lack of chaos of border abruptness is a feature of benignancy according to revised pattern analysis which is consistent with the diagnosis of ink-spot lentigo. 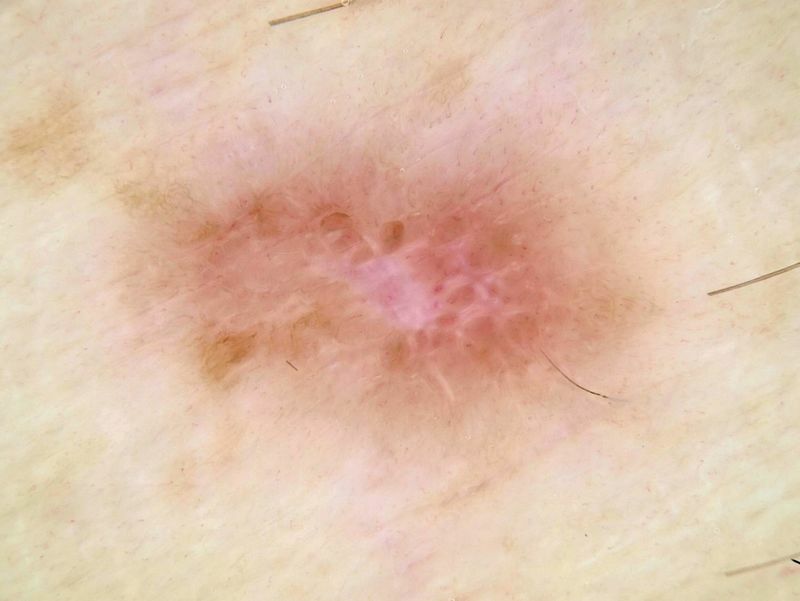 Figure 9:As well as having chaos of pattern and colour this invasive melanoma has chaos of border abruptness with an abrupt border at the lower right extremity and a gradual border elsewhere. Grey or blue structuresThis glossary term has not yet been described. (including grey or blue structurelessThis glossary term has not yet been described.). 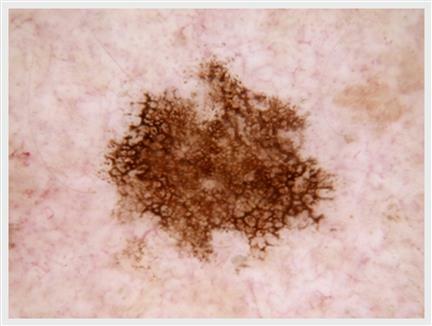 This clue, in a chaotic lesion, applies to both melanocytic and non-melanocytic malignancies. Grey colour correlates with melanin in the superficialThis glossary term has not yet been described. dermis and this can be in melanocytes, keratinocytes or as melanin incontinence in melanophages, which is frequently the result of an immune attack even on lesions that remain confined to the epidermis. Grey colour is the most sensitive clue to malignancy and is seen in most in situ melanomas (see figure 10) and many pigmented basal cell carcinomaThis glossary term has not yet been described. (pBCC) and pigmented squamous cell carcinomaThis glossary term has not yet been described. (pSCC). In a study on flat pigmented facial lesions the presence of grey colour was found to have a sensitivityThis glossary term has not yet been described. and specificityThis glossary term has not yet been described. for the diagnosis of melanoma of 95.8% and 30.6% respectively . 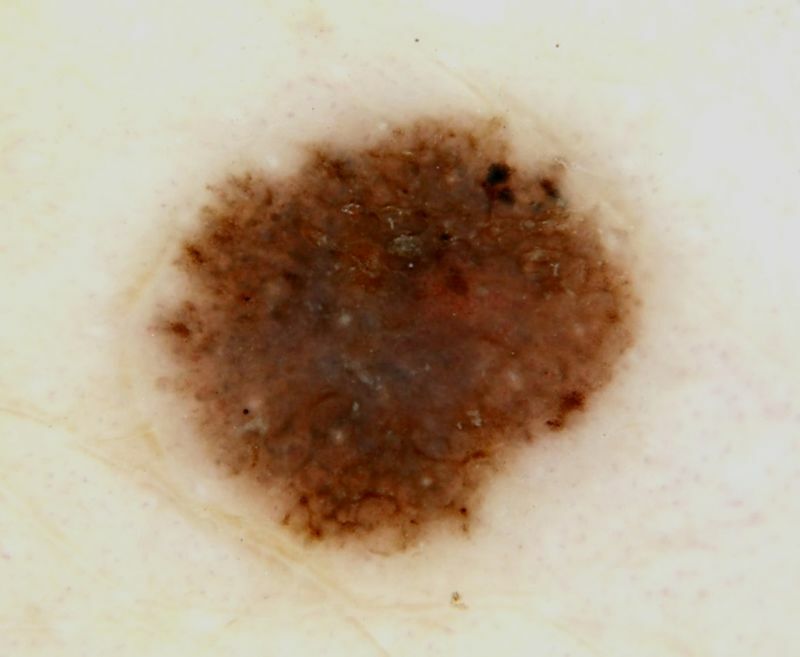 Figure 10: Grey colour in this in situ melanoma is seen as contrasting with the background colour of brown – a colour invariably present in a pigmented (melanotic) melanocytic lesion. Blue colour correlates with pigment in the deep dermis, most commonly in nested melanocytes or nests of BCCAbbreviation for Basal Cell Carcinoma (see figure 11). 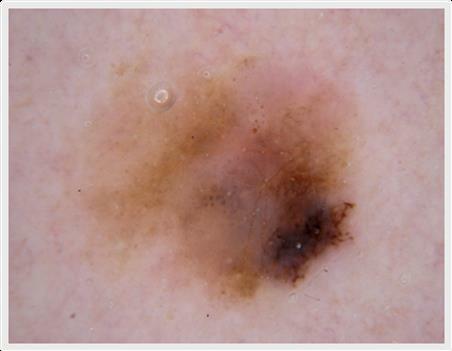 Figure 11: Blue colour in this invasive melanoma again contrasts with brown colour. An Eccentric structureless area must cover a sufficient portion of the lesion for it to form a pattern, it must be eccentrically located, it much be contrasted to a structured pattern, or alternatively to an area of distinctly different colour which is also within the lesion and it must be a colour other than skin-coloured. If coloured with the colours of melanin it may have been produced by the chaotic behaviour of malignant melanocytes, if pink it is may be caused by increased blood flow from the high metabolic demand of tumour tissue and if white it may correlate with fibrosis after regressionThis glossary term has not yet been described.. This clue applies to both melanocytic and non-melanocytic malignancies (see figure 12). 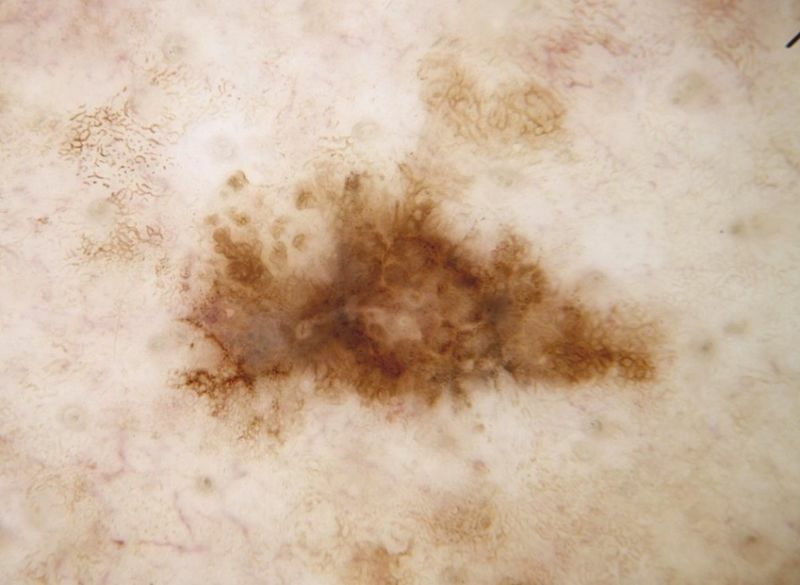 Figure 12: An eccentric structureless (light brown) area extends to the left of a structured (lines reticularMetaphoric term: pigment network melanocytic lesions dermatofibroma solar lentigo) area in this in situ melanoma. Thick lines reticular are defined when the lines are at least as thick as the holes that they surround and in melanocytic lesions they may correlate with rete ridgesEpidermal extensions that project into the underlying dermis which are widened by pigment laden malignant melanocytes. They are a clue to malignancy in a chaotic lesion and will be focal rather than evenly widespread over the lesion (see figure 13). 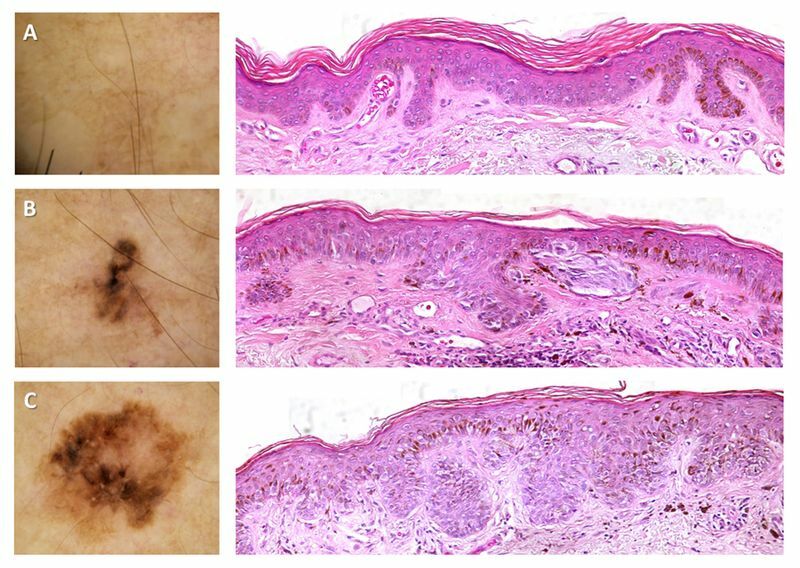 This clue is specific to melanoma as the presence of reticular linespigment network melanocytic lesions dermatofibroma solar lentigo effectively rules out the diagnosis of basal cell carcinomais the most common skin cancer, and one of the most common cancers in the United States. While BCC has a very low metastatic risk, this tumor can cause significant disfigurement by invading surrounding tissues or squamous cell carcinoma. Thick reticular lines frequently occur in seborrhoeic keratoses due to acanthotic rete ridges (due to a proliferation of pigmented keratinocytes) but they will be widespread and other clues to seborrhoeic keratosis are expected to be present. Figure 13: This in situ melanoma has more than one pattern with lines reticular on the right and an eccentric structureless area on the left. Inferiorly the reticular lines are focally thicker than the holes they surround. The fact that this clue to malignancy is unequivocal but focal is consistent with the chaotic behaviour of malignant tissue. 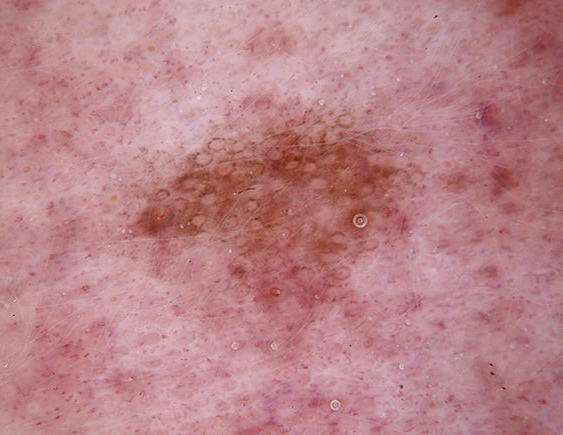 Black dots and clods, peripheral, correlate with pigmented pagetoid melanocytes and nests of melanocytes in melanomas and therefore this clue should be specific to melanoma. In reality, because dots are common in both pBCC and pSCC in situ, and because grey may be perceived as black, this clue can also be seen in those lesions. The reason for the designation that they be peripherally located is because black dots can be seen centrally in neviThis glossary term has not yet been described. which have been traumatised, correlating with pigment in ascending keratinocytes. 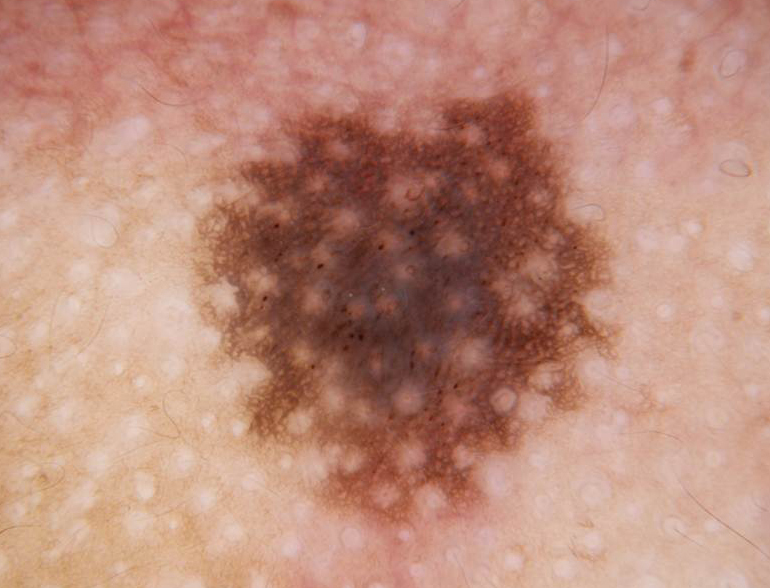 Pagetoid spread can occur anywhere in a melanoma so when black dots or clods are seen peripherally they are regarded as a clue to malignancy (see figure 14). 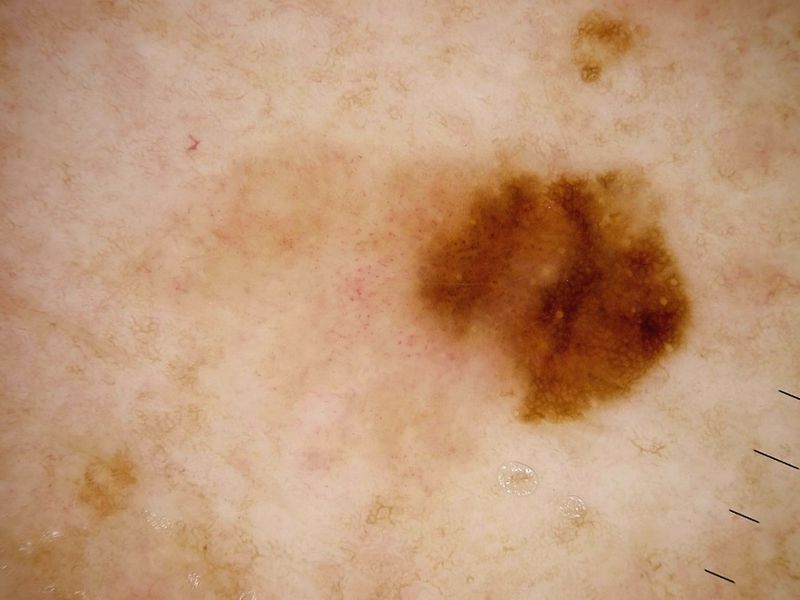 Figure 14: In this small (4mm diameter) young melanoma in situ the feature of peripheral black clods at the upper right border of the lesion gives the lesion both chaos and a clue. Lines radial or pseudopods, segmental, are clues to malignancy, pseudopods being specific to melanoma and lines radial segmental being found in all three pigmented malignancies. 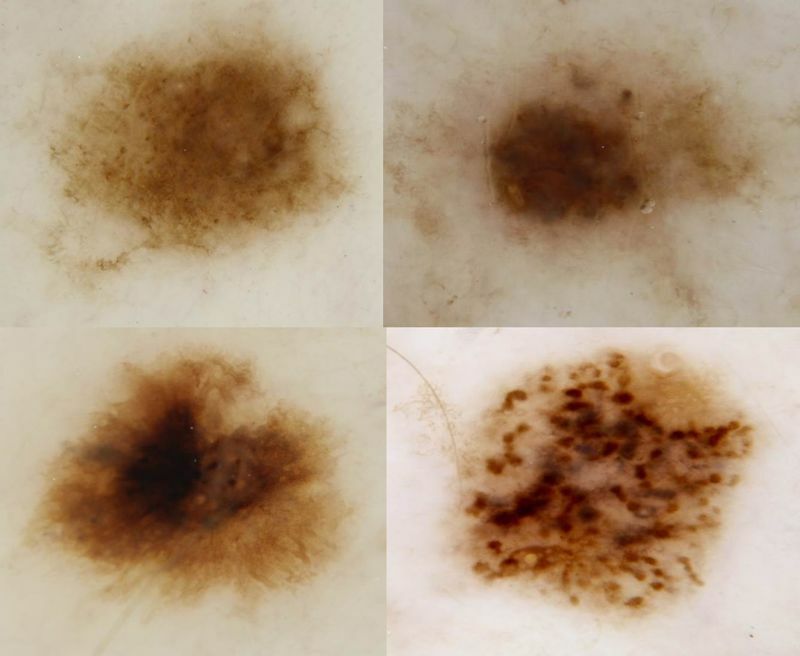 In melanocytic lesions these structures correlate with fascicles of pigmented melanocytes extending from the periphery of a lesion and they signify growth. In melanomas they should be distributed asymmetrically and should extend from reticular lines, clods or structureless areas of equivalently dense pigmentation to the radial lines or pseudopods (see Figure 15). 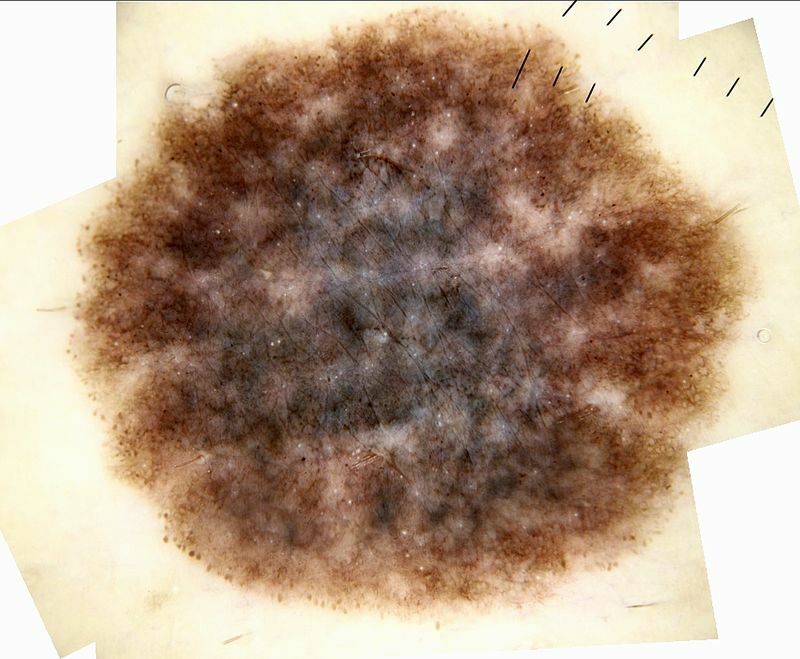 Figure 15: Lines radialstreaks/pseudopods segmental in a melanoma in situ extend from pigmented structures as dark as or darker than the radial linesstreaksThis glossary term has not yet been described./pseudopods. Figure 16: In this pBCC the radial lines are of a morphology very specific to pBCC in that they converge and also extend from a non-pigmented part of the lesion. Lines radial segmental are also seen in pSCC in situ in which they are usually created by dots in a linear arrangementThis glossary term has not yet been described. (see Figure 17). Figure 17: Lines radial segmental are composed of dots in linear arrangement in this pSCC in situ. Surface keratin is an additional clue to the diagnosis. White lines must be whiter than normal surrounding skin and they may be polarising-specific (polarising-specific blue lines have the same significance) or alternatively white lines that are seen with both modalities. Polarising specific white lines are straight shiny white lines orientated perpendicularly to each other but not crossing. They are only seen with polarising dermatoscopy (see figure 18) but they may sometimes correlate with reticular white lines seen with non-polarised dermatoscopy. 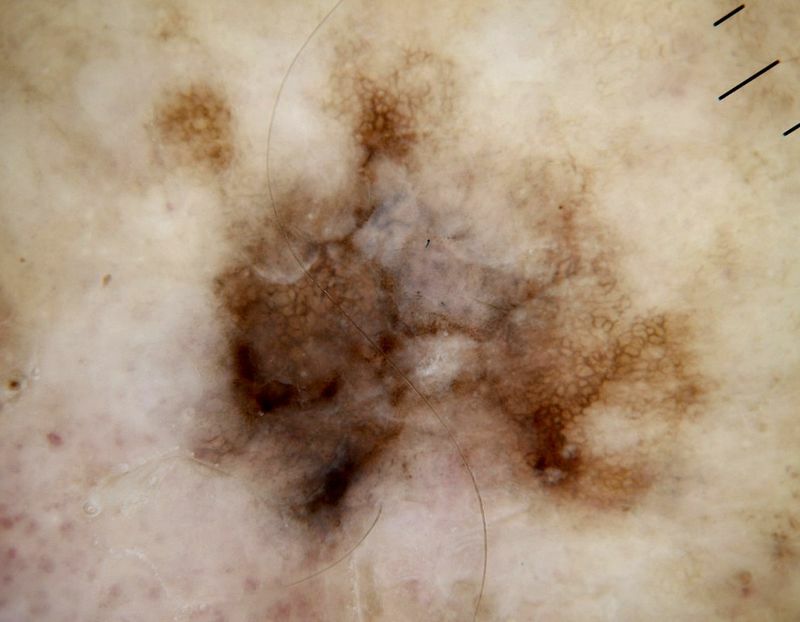 Figure 18: Polarised dermatoscopy of this melanoma in situ displays white lines which are seen to be in a perpendicularly orientated arrangement. Polarising-specific white lines can be seen very commonly in BCC (pigmented or non-pigmented) and they are not unusual in melanoma (pigmented or non-pigmented). They are only rarely seen in pSCC in situ. They are also commonly seen in both dermatofibroma (DF) (see figure 19) and Spitz neviThis glossary term has not yet been described. but their presence is not expected in any other type of nevus (unless traumatised) or in seborrhoeic keratosis. 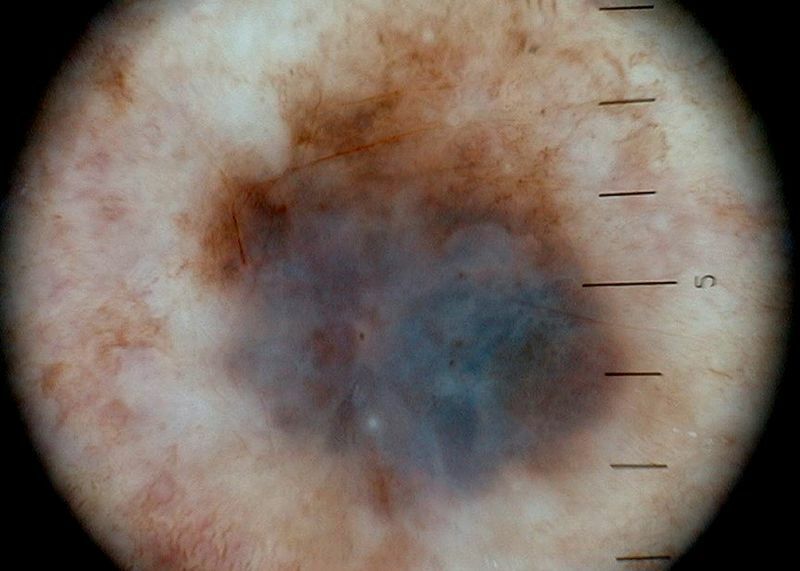 Figure 19: Non-polarised dermatoscopy of an invasive melanoma demonstrated white lines in a reticular arrangement. Lines parallel on the ridges (acral) or lines parallel chaotic on the nailsThis glossary term has not yet been described. Lines parallel on the ridges (acral) or lines parallel chaotic on the nails are a clue to melanoma specifically on acral skin (figure 20), or in nail matrixThis glossary term has not yet been described. (figure 21) respectively. This is the only one of the listed clues to malignancy which is specific to a particular anatomical site. It is important to remember that the longer an acral or nailThis glossary term has not yet been described.-matrix melanoma remains untreated; the more likely it is to develop any of the other clues to melanoma. Figure 21: Lines parallel chaotic (varying in width, interval and colour) in a nail matrix melanoma. MelanomaThis glossary term has not yet been described. may also arise in an acral naevus in which case any of the other 8 clues will override a benign parallel furrow patternVolar pigmentation forming solid or dotted lines, parallel, thin, on the furrows (sulci superficiales or invaginations in dermatoglyphics). The lines are occasionally doubled, each line is beside the furrows. which may be present (see figure 22). Figure 22: In this image the clue of radial lines segmental (right and inferior portions) overrides the clue of lines parallel in a furrow pattern (upper left). This is a melanoma arising in an acral naevus. Note that in the benign furrow pattern there is pigment over the ridges but the lines (as assessed at the edges) lie in the furrows (image courtesy Agata Bulinska). Polymorphous vessels are a clue to both melanoma and pBCC but not to pSCC in situ. Pigmented BCC often has a monomorphous pattern of serpentine or serpentine branched vesselsThis glossary term has not yet been described. but it may have a pattern of polymorphous linear vesselsLinear mildly curved vessels considered irregular when different sizes shapes and curves with a haphazard or random distribution are presented and considered regular when short and fine (thin) linear vessels prevail various diagnoses (see figure 23), especially on the lower limb. A pattern of dotSee [[Glossary:Dots|Dots]] vessels is not expected in pBCC but ulceration, commonly present in BCC, and associated keratinisation may produce polymorphous vesselsmultiple types of vessels are present may indicate malignancy in appropriate context for example in flat melanocytic lesions including looped vesselsmetaphoric term: hairpin vessels <br /> two parallel linear vessels forming a half looped or hairpin like structure <br /> seen in seborrheic keratosis viral warts in radial arrangement and even dot vessels (see figure 24). In melanomas, polymorphous vessels may include various types of linear vessels in raised portions, and a pattern of dot vessel as well as any pattern of linear vessel in macular portions. Generally other clues apart from polymorphous vessels (pigment clues and/or white lines) are expected in a melanoma and the vessel clues are then useful in differentiating melanoma from pBCC and pSCC in situ (see figure 25). DotSee [[Glossary:Dots|Dots]] vessels correlate with vessels ascending in dermal papillae and are not therefore expected in the raised portion of a melanoma in which the regular morphology of dermal papillae is not expected. Figure 25: Chaos and the clue of grey colour pointThis glossary term has not yet been described. to malignancy. A pattern of serpentine vesselslinear irregular vessels with multiple bends. Seen with flat BCC and melanoma centrally combined with a vast pattern of dot vessels is consistent only with melanoma; Melanoma invasive. Pigmented SCCSquamous cell carcinoma in situ is expected to have a monomorphous pattern of coiled vesselsglomerular vessels tightly coiled vessels resembling the glomerular apparatus of the kidney Bowen disease which may resolve as dots depending on visual acuity and magnification (see figure 26). 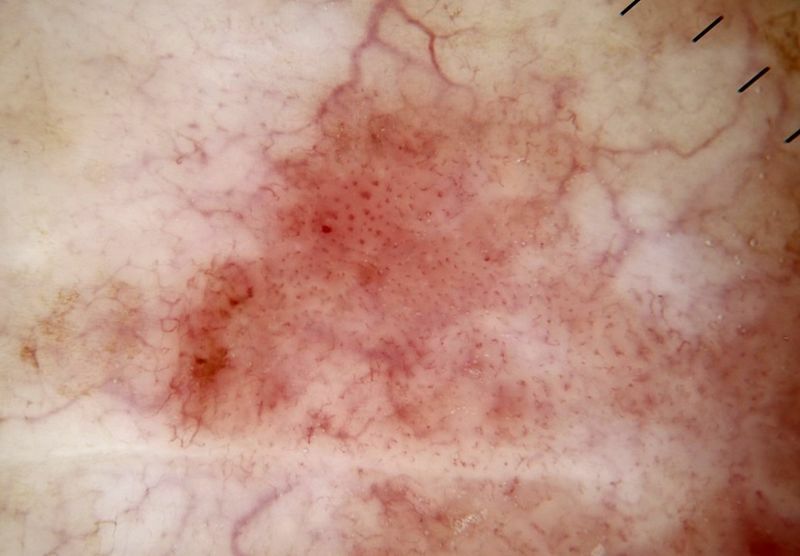 Figure 26: A lightly pigmented SCC in situ displays a monomorphic pattern of coiled vessels, which on the right hand side of the lesion resolve as dots. A few linear serpentine vessels dermal plexus vessels seen at the edge of the lesion do not make this a polymorphous pattern. Angulated lines are straight lines, not reticular or branched, meeting at angles 90* or more, but not crossing. These lines may join to enclose a polygon. Straight pigment interfaces have the same significance as straight lines. This clue, in a chaotic lesion, is a valuable clue to melanoma (see figure 27) but may also rarely be seen in pBCC (see figure 28). 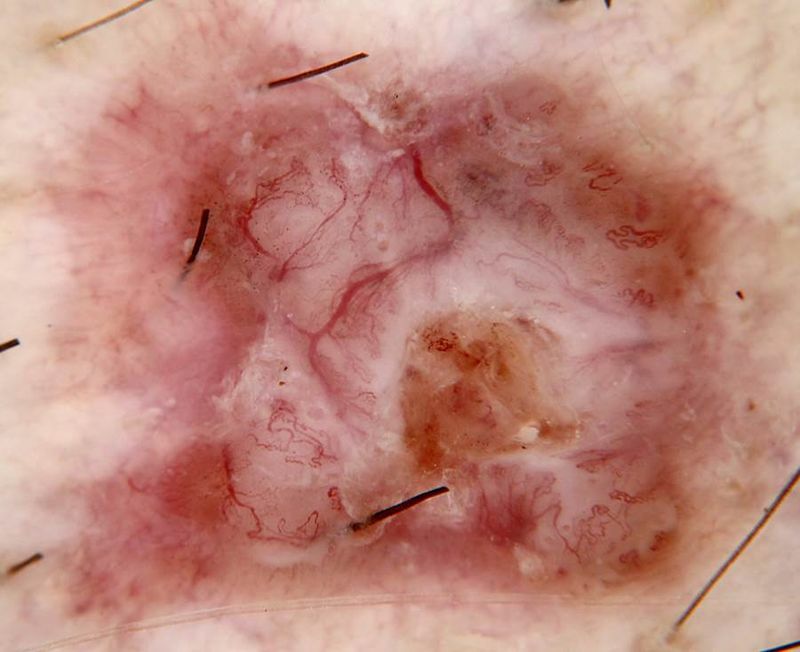 Figure 27: Angulated lines form both complete and incomplete polygonslines angulated or polygonal (non-facial skin) in this melanoma in situ. Figure 28: Angulated lines in a pigmented BCC. This includes a lesion with a history of change, lesions with monitored change (see figure 29) and lesions with dermatoscopic clues to change such as the presence of peripheral clods (see figure 30) or radial lines/pseudopods. The presence of peripheral clods must be considered in the context of the age of the patient. Peripheral clods in an otherwise unremarkable lesion with the morphology of a naevus, is consistent with the diagnosis of a growing naevus under the age of 30 but not over the age of 50. In between these ages the clues must be weighed and discretion exercised and if doubt remains then excision biopsy is prudent. 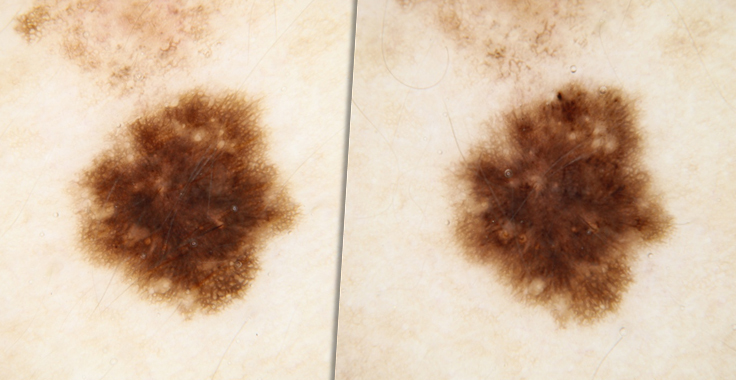 Figure 29: A pigmented skin lesion (image on left) has been dermatoscopically monitored over 6 months (image on right). 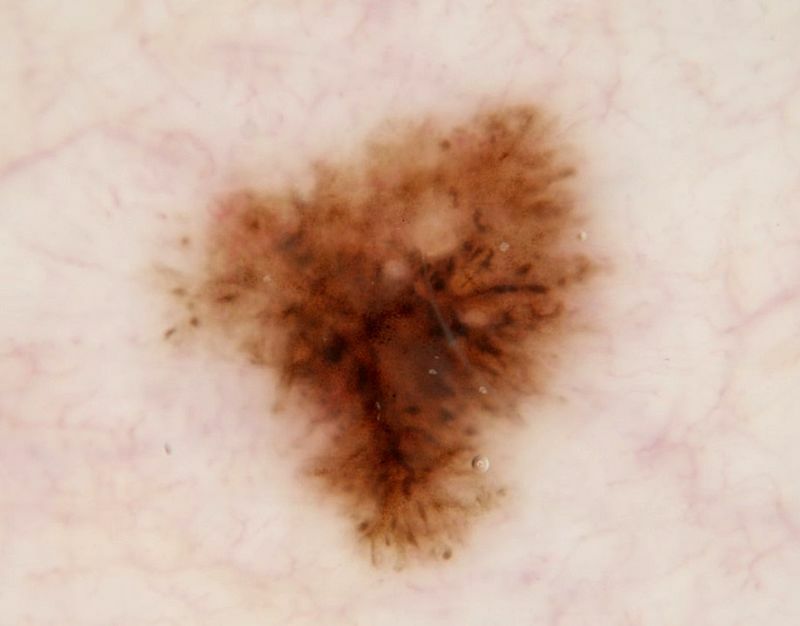 The structural change of the appearance of a small cluster of peripheral black dots (upper extremity) lead to excisional biopsy; melanoma in situ. 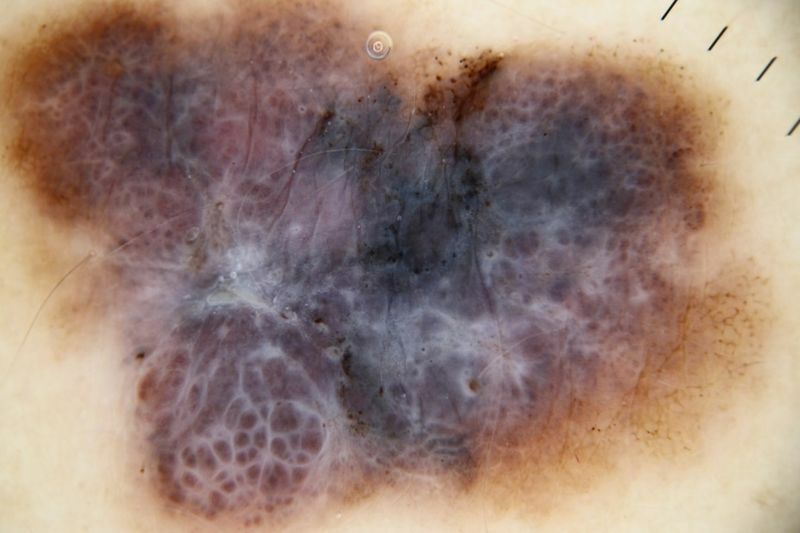 Figure 30: A large symmetrical pigmented skin lesion on the abdomen of a 70 year old man has the dermatoscopic clue to change of peripheral clods/dots. 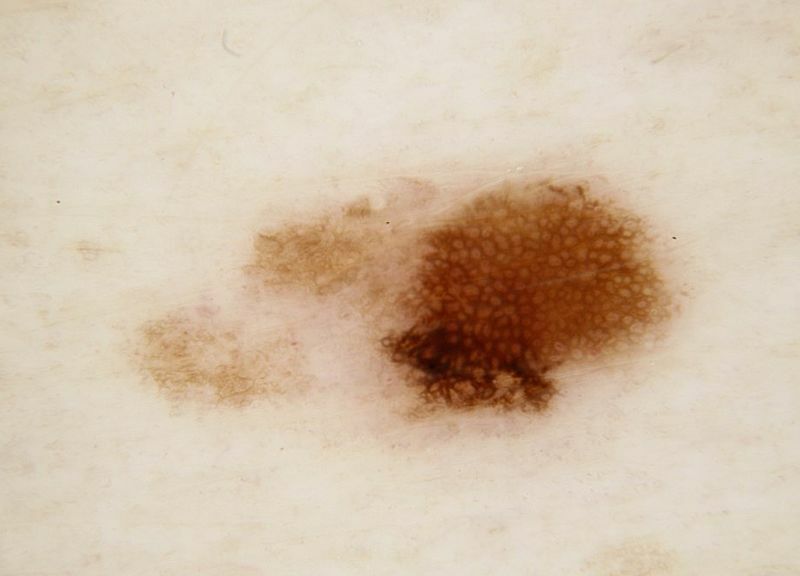 Excisional biopsy revealed it to be an invasive melanoma. We define small, arbitrarily, as less than 6mm in diameter, this being the size cited in the clinical ABCD method of dermatoscopy. 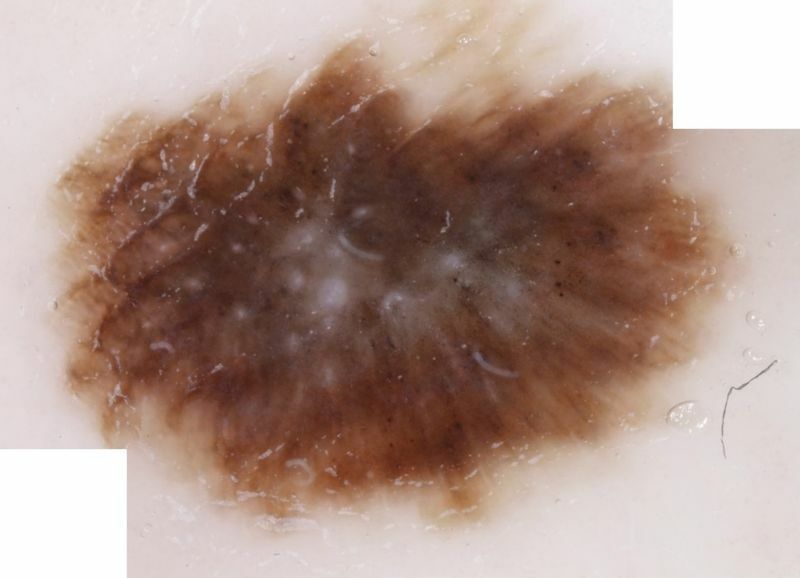 This 3mm diameter nodular melanoma shown in figure 31 was arguably symmetrical but in addition to peripheral clods as a dermatoscopic clue to change, it had the clue of grey colour. 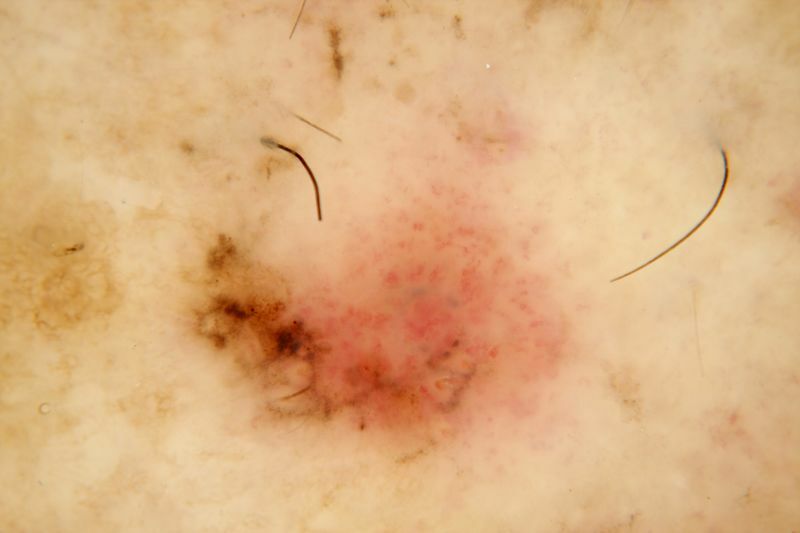 Figure 31: This pigmented skin lesion on the flank of a 60 year-old lady was only 3 mm in diameter but it was raised. Although it had structural symmetry there were 2 relevant exceptions. Firstly there was the dermatoscopic clue to change of peripheral clods and secondly it was both small and nodular with the clue of grey structures; nodular melanoma (Breslow thickness 0.8mm). 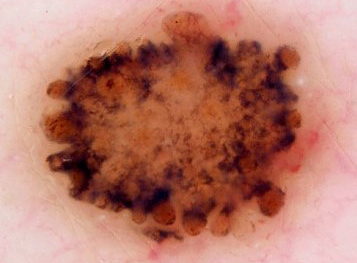 Figure 32: A 4mm diameter pigmented skin lesion on the ear of an adult man is both a small lesion with a clue (dermatoscopic grey) and also a lesion on the head and neck with dermatoscopic grey. However a lesion which has the unequivocal morphology of a naevus (symmetry and a gradual border over the total periphery), as well as historical stability, does not need to be excised. Also the common lesion, DF, is a small nodular lesion which frequently has central polarising-specific white lines and if DF can be diagnosed confidently by clinical and dermatoscopic criteriameasure of how well one variable or set of variables predicts an outcome excision biopsy is not necessary (see figure 33). Figure 33: This lesion is a small nodular lesion with the clue to malignancy of polarising-specific white lines. It has the morphology of a dermatofibroma with symmetry of pattern and colour and a central white area and does not require excision. This clue acknowledges that fact that young melanomas at these locations, possibly related to a physical barrier effect of numerous follicles, may be symmetrical (see figure 34). A study on flat pigmented facial lesions found that the presence of any grey structures had sensitivity and specificity for melanoma of 95.8% and 30.5% respectively while grey circles had a sensitivity of 54.2% and a specificity of 83.3% . Pigmented circles (any colour) were similar to grey circles with a sensitivity and specificity for melanoma of 70.83% and 76.9% respectively  (unpublished data from the same study). Any lesion on acral skin with a parallel ridge pattern. This clue acknowledges that fact that young melanomas at these locations, possibly related to a physical barrier effect of numerous eccrine ducts, may be symmetrical (see figure 20). Chaos and clues is not a method designed for robots and it should not be regarded as an ultimate method, set in stone. It has been designed as a useful tool, avoiding tedious mathematical calculations, unburdened by a language of innumerable poorly defined metaphorical terms carrying preconceived diagnostic implications and it is suitable for seamless integration into routine practice. Individuals are encouraged to use it as a framework on which to organise their accumulated experience as they individualise the method for their own style and practice. ReferencesThis is material contained in a footnote or bibliography holding further information. ↑ 2.02.12.2 Rosendahl et al. : Dermatoscopy in routine practice - 'chaos and cluesThis glossary term has not yet been described.This an algorithm used in dermoscopy [[Chaos and Clues]]'. Aust Fam Physician 2012;41:482-7. PMID: 22762066. ↑ Bourne et al. : BLINCK-A diagnostic algorithm for skin cancerThis glossary term has not yet been described. 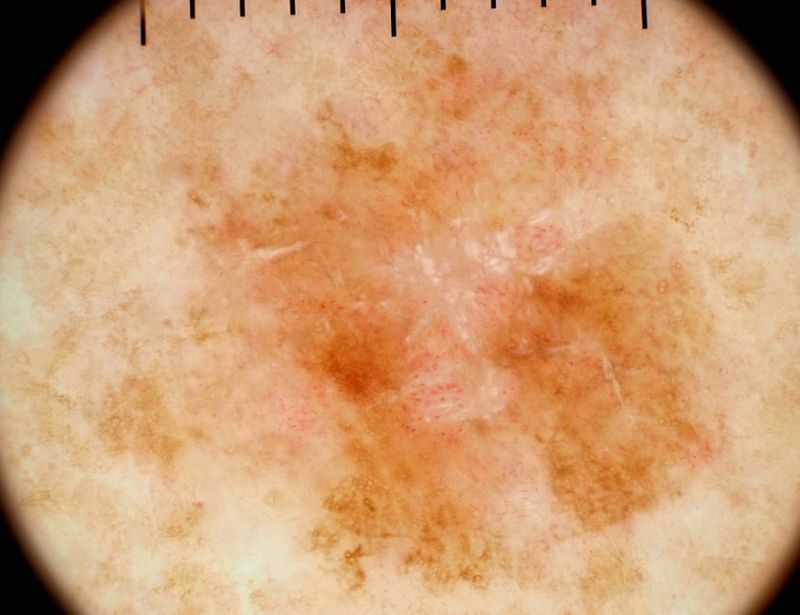 diagnosis combining clinical features with dermatoscopy findings. Dermatol Pract Concept 2012;2:202a12. PMID: 23785600. DOI. ↑ 12.012.112.2 Tschandl et al. : Dermatoscopy of flat pigmented facial lesions. J Eur Acad Dermatol Venereol 2015;29:120-7. PMID: 24661420. DOI. This page was last modified on 4 October 2017, at 12:25.